Imagine discovering this, one of the most snowily romantic of works, in an overwhelming performance and recording. That, in short, is what you have here. 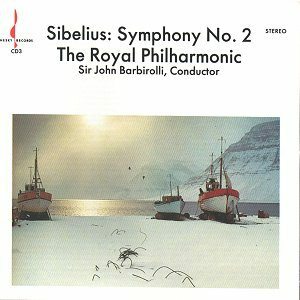 I would certainly recommend this recording with the live Beecham and Szell as representatives of the best traditions (and there are different approaches to this symphony). Oh you will find more refined sound and more generous couplings however the chances of bettering this musical event are weighed against you. The symphony belongs in a group of works which includes the under-rated Kullervo, the first two symphonies, the Lemminkainen Legends and En Saga. Tchaikovsky and Balakirev ( in the third movement track 3 at 8.20 listen for echoes of Tamara). The second movement's (andante ma rubato) steadily fluttering woodwind are memorable for its slow motion butterfly movement. Playing of great poetic eminence is drawn from everyone and this is aided by Charles Gerhardt's recording which was made at Walthamstow Town Hall in the 1960s as part of the Readers' Digest classical music series. Barbirolli time and again evinces a grand feeling for dynamic terracing. He is a grandee of the whirlwind and a master romancer. The crowning glory of full-throated fanfares in the finale is rivalled only by Beecham in his shout-spurred BBCSO Colston Hall performance (for years available on a World Records Club LP). There is a great deliberation about the Allegro Moderato finale but no feeling of lassitude. The last pages tremble with intensity (18.24 ) and all unforgettable majesty of a fanfare-crowned finale. I am not sure about playing times but Barbirolli's later recording of this symphony (HMV) is not as fleet or as intense. There are superb and specific (English only) notes.